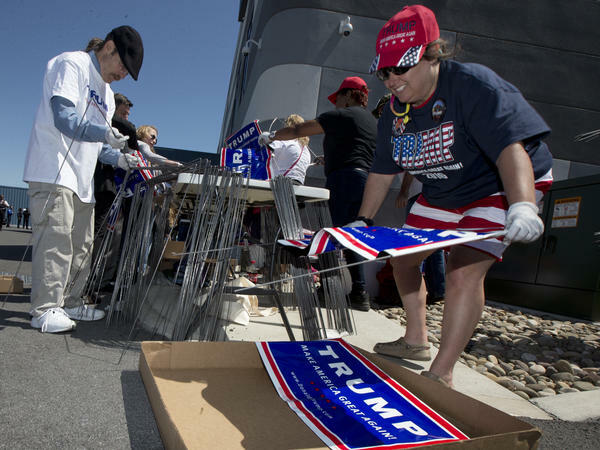 Mary Jo Trapani, a volunteer for Republican presidential candidate Donald Trump, gathers posters for a campaign rally in Hagerstown, Md. The Republican National Committee credits a strong network of local campaign staff and volunteers along with millions of door knocks and phone calls for victory up and down the ballot last week. The Republican National Committee says its data-driven voter turnout operation — which used lessons learned by studying President Obama's winning campaigns of 2008 and 2012 — was a key to its success up and down the ballot last week. Donald Trump shocked the pollsters and pundits not just by winning but by taking a surprisingly large Electoral College victory. And just as important to the RNC is the fact that the GOP was able to stave off a takeover of the Senate by Democrats, in a year when Republicans had many more incumbents and GOP-held seats to defend. Throughout the campaign, especially during the primaries in the first half of 2016, there were questions about the relationship between the Republican Party and the Trump campaign. But once Trump formally secured the nomination, the RNC and its chairman, Reince Priebus, were all in. Certainly Trump's outsider status, his ability to reach disaffected voters, and his blunt, proudly politically incorrect speeches and Twitter presence were the driving force behind his victory, but the RNC wants to make sure the world is aware of just how much it did to help Trump and other GOP candidates out at the ballot box. "We worked closely and well with the Trump campaign," RNC Political Director Chris Carr said at a post-election press briefing in Washington. "We were always on the same page." Wherever Trump went, the RNC had a major presence, working the audience, getting people registered and signing up volunteers. Carr said the extent of that in-person outreach at rallies was unprecedented for the party. Carr also said that the party studied how President Obama's two campaigns for the White House used and analyzed data, identified potential voters and put together decentralized teams of volunteers in every single state in the nation. Instead of having most of the action in any given county based at so-called Victory Offices (local campaign offices), it took a page from Obama for America and put the focus in individual neighborhoods called "turfs" — each with 8,000 to 10,000 targeted voters. There, a field organizer (a paid campaign staffer) would train neighborhood team leaders. One other thing borrowed from the Obama campaign — the establishment of the Republican Leadership Initiative, which was a program to set up campaign fellowships to train future GOP leaders and operatives. And where the Romney for President campaign of 2012 endured major Election Eay glitches in the computer program designed to drive the final turnout push, this year the RNC says its digital operations worked smoothly, identifying potential voters early in the year and tracking them closely over the course of the campaign. 24 million door knocks: more than 9 million of them in the final four days, compared with just 11.4 million total for all of 2012. 26 million phone calls: another huge increase from four years earlier. $200,000 to $300,000: spent every day on advertising and fundraising on Facebook for 150 days straight. The RNC says it paid off. And perhaps the single most telling number included in the presentation is that 220 counties nationwide that went for President Obama flipped and supported Donald Trump this year.